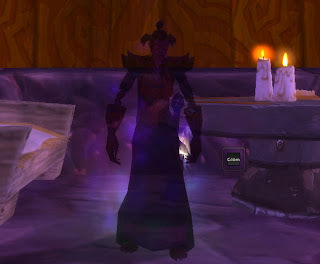 Tonight I finally caved in and respecced Glömsk to "shadow priest". Apparently it will enable me to finish off mobs a lot quicker. 8-) I've been running strictly "holy" up until this point (and I'm proud of it! :-p) but it's getting increasingly tedious to flap away with wand and shield to kill mobs. Though I must say, faster as it may be - shadow spells have _not_ got the flare holy spells have. I already miss the thunderous sound and lightningflame-effect of Holy Fire?